As an endoplasmic reticulum heat shock protein (HSP) 90 paralogue, glycoprotein (gp) 96 possesses immunological properties by chaperoning antigenic peptides for activation of T cells. 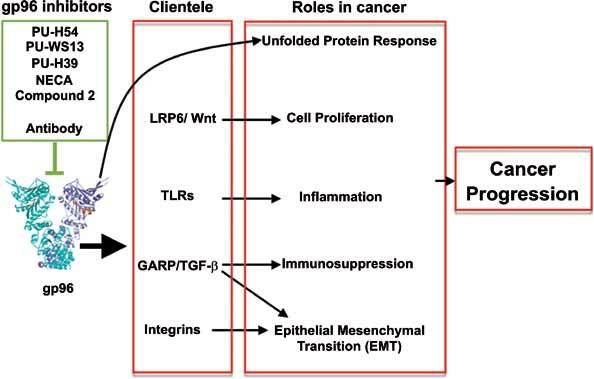 Genetic studies in the last decade have unveiled that gp96 is also an essential master chaperone for multiple receptors and secreting proteins including Toll-like receptors (TLRs), integrins, the Wnt coreceptor, Low Density Lipoprotein Receptor-Related Protein 6 (LRP6), the latent TGFβ docking receptor, Glycoprotein A Repetitions Predominant (GARP), Glycoprotein (GP) Ib and insulin-like growth factors (IGF). Clinically, elevated expression of gp96 in a variety of cancers correlates with the advanced stage and poor survival of cancer patients. Recent preclinical studies have also uncovered that gp96 expression is closely linked to cancer progression in multiple myeloma, hepatocellular carcinoma, breast cancer and inflammation-associated colon cancer. Thus, gp96 is an attractive therapeutic target for cancer treatment. The chaperone function of gp96 depends on its ATPase domain, which is structurally distinct from other HSP90 members, and thus favors the design of highly selective gp96-targeted inhibitors against cancer. We herein discuss the strategically important oncogenic clients of gp96 and their underlying biology. The roles of cell-intrinsic gp96 in T cell biology are also discussed, in part because it offers another opportunity of cancer therapy by manipulating levels of gp96 in T cells to enhance host immune defense. GP96, Oncogenic roles, Clientele, Cancer, Small molecule inhibitors, Monoclonal antibodies, Cellular therapy. Department of Microbiology and Immunology, Hollings Cancer Center, Medical University of South Carolina, Charleston, SC 29466, USA.